Cotton placemats are rubbish for three reasons; food stains, laundry wear and tear and worst of all IRONING (my most hated activity). Ditch the extra housework, invest in Chilewich mats and up your table style factor. 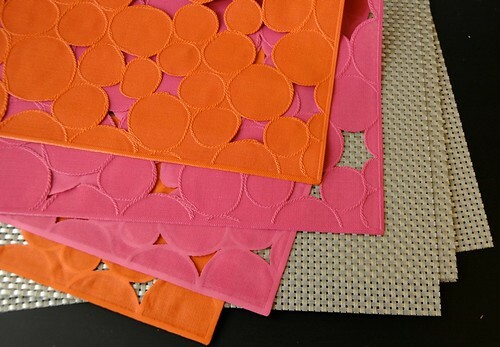 Their placemats, table runners and floor mats are made of a special woven rubber material which can be wiped clean. The numerous colours and weaves won’t leave you short of choice and are incredibly beautiful. Their website lists the UK locations where they are sold like Conrans and Selfridges. If you live in the US order them on-line. 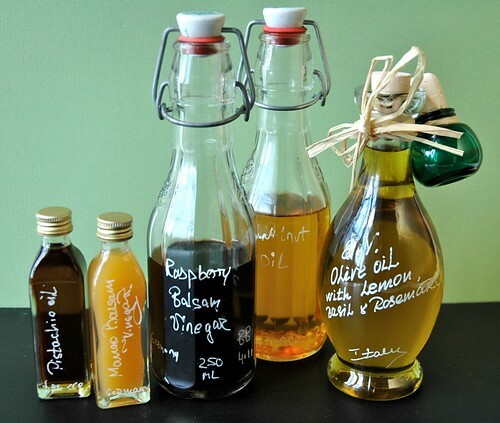 Outstanding vinegar and oils make or break salads. 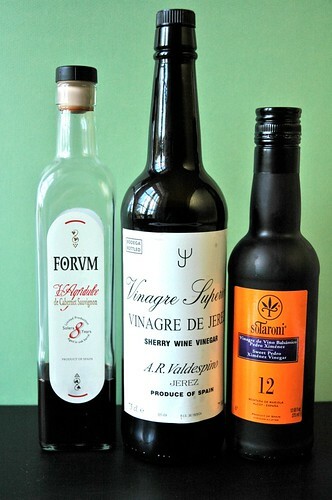 Good quality vinegar, in particular, is tricky to find. The supermarkets are full of uninspiring, watery, acidic bottles. Vom Fass has just the ticket. Visit one of their concessions in Selfridges or order on-line to sample their amazing flavours. Raspberry balsamic and walnut oil is my fav combo but I am also beguiled by the mango balsamic and lemon extra virgin olive oil. Best of all they have a green policy which allow you to bring in your empty bottles for refills. Available in the UK or USA. Spanish vinegars, hands down, make the best dressings that have ever-blessed my lettuce. Forum Cabernet Sauvignon red and Valdespino sherry are simply amazing. Also noteworthy is the Sotaroni sweet Pedro Ximenez, which is a sherry balsamic vinegar and packaged in a sleek black bottle. All aged for at least 10-20 years, they are sweet and smooth. Find them at good delis, Brindisa’s shop in the Borough Market or on-line. 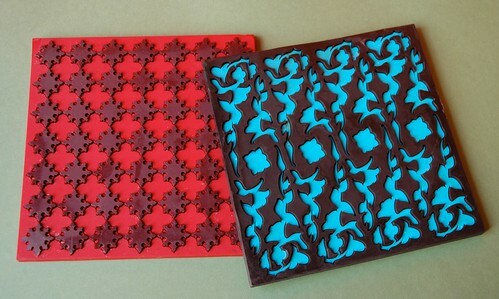 Trivets are not the most glamorous items but these Moroccan-inspired rubber versions are tres chic. No need to hide in the kitchen drawer, the numerous colours and designs spruce up any dull kitchen and are perfect for taking a hot saucepan off the stovetop. My husband was dreading this store opening in London. Whenever I make trips back to the States, a shopping trip to Anthropologie is a must. The housewares and clothes are equally seductive….with quirky retro glassware, cutlery and dishes. 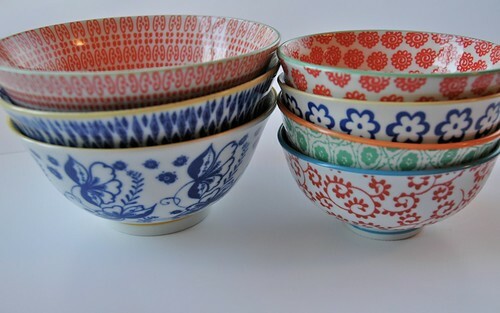 These Asian bowls caught my eye and are perfect for soups, dips or serving condiments. It’s not often you can whizz into Conran’s and buy something wonderful for under £20. 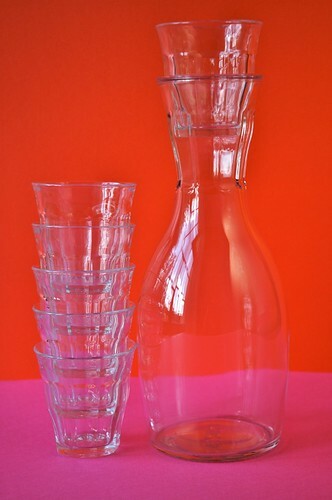 This Picardie glass carafe and matching glasses are practical and oh so charming. We can all do with a bit of French chic in our kitchens. Serving water in them is one use but there are many more. I love them for wine, mini trifles, chocolate mousse or for serving relishes. On a visit to NYC, I tripped across Jonathan Adler’s shop in Soho. His hand-crafted pottery, cushions and home-wear are unbelievably gorgeous. But the best part is the irreverent humour he designs into them. 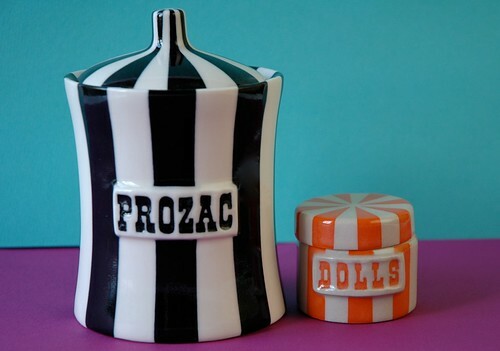 These ceramic jars are perfect case in point. It makes me smile whenever I walk past them in my kitchen. Liberty’s stocks some of his products or they ship to the UK. To avoid duty try and get a friend to bring them back for you. Finding original plates and serving dishes isn’t easy. Most big stores sell the same boring stuff. Ceramica Blue, in the heart of Notting Hill, is just the opposite. You will be hard pressed not to spend serious money there. 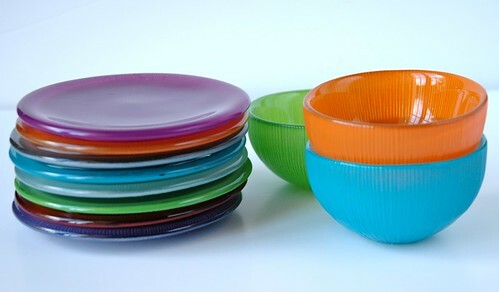 These little bright glass plates and bowls get used plenty for dinner parties and are dish washer friendly. Ideal for dishing up canapes and other dainty snacks. Give your Asian food a glamorous touch by adding little dipping bowls, colourful chopsticks or ceramic spoons. Chinatown is chock full of cheap treasures that won’t dent your wallet. 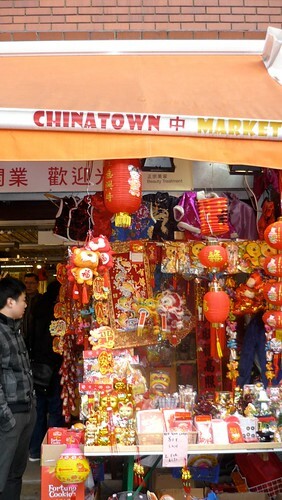 Chinatown Market on Little Newport Street is one of my favorites. Look past the gilded cats with moving arms and other kitsch to search for bargains. If you’re a food poseur like me, then Spikomat is your dream come true. Canapes or bbq’s will look straight out of a magazine with these gorgeous wooden skewers. 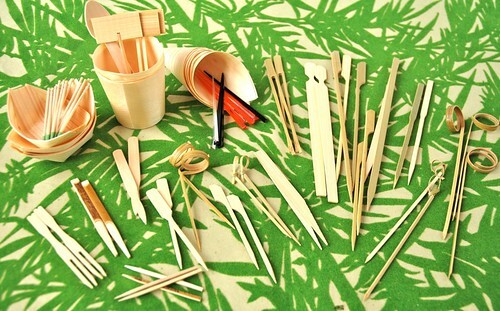 Their on-line store sells everything from delicate toothpicks with loops to rough-hewn bamboo skewers. The order quantity is the only downside (they mainly supply caterers). But you can either share with a friend or stock up for life. People that own label machines used to scare me. ‘Never say never,’ because after a house refurbishment I became one of those strange people printing out tidy tags. It started with my office files but then spread to the kitchen spice cupboard. Fed up with fishing through jars on a shelf, I put them in a drawer and labeled the lids. The Danish company Bodum makes smart little glass jars with tightly sealed lids, but you could use jam jars or something similar. 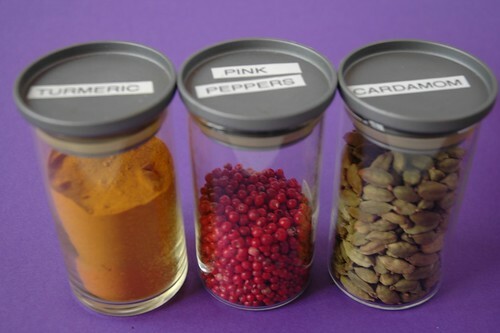 Ikea on-line also stocks inexpensive glass jars. Find your label machine at any office store for under £20 and get printing. 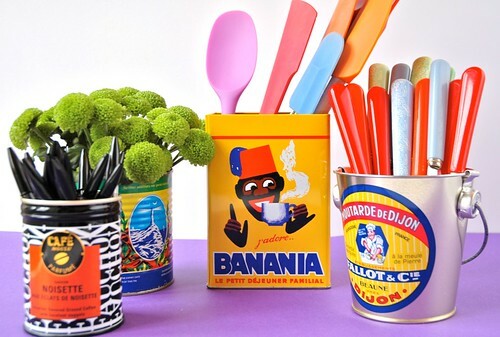 Bright metal tins are cheap chic for perking up your kitchen. Display them on shelves, store biscuits and cookies or hide your odd and ends (i.e. junk). 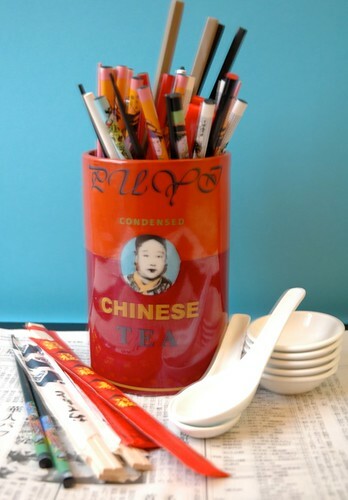 They also make cheery containers for holding pens, utensils, or as small flower vases. 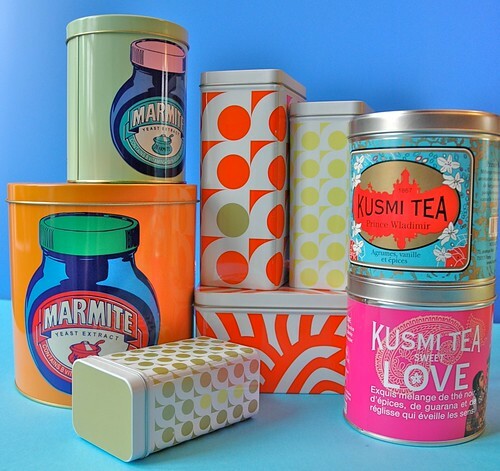 Rocket St. George sells the retro marmite tins on their website and Ikea has inexpensive nested boxes with lids. Save beautiful Italian plum tomato cans or keep your eyes peeled the next time your in Paris for old-fashioned mustard, tea, or cereal tins.